The European Union-funded SWITCH to Green Initiative is implemented by the UN Environment Programme (UNEP, or UN Environment) as well as many partners from the private sector and civil society, and brings together inclusive green economy programmes in 34 countries in Europe, Asia, Africa, and the Mediterranean. Collectively, the SWITCH-Asia, SWITCH Africa Green, SwitchMed and EaPGreen projects have contributed to 350,000 green jobs and leveraged more than US$1.1 billion in investments. Watching yet another truck dumping a load of vile-smelling fish processing waste at a landfill located next to Kisumu’s largest informal settlements, the foremost thought in Newton Owino’s mind was “we can do better.” A leather chemist by profession, Owino decided to explore creative ways to utilize the waste produced by the many fish processing plants around Kisumu, in Kenya’s Lake Victoria region. Fifteen years later, the energetic entrepreneur runs a thriving leather business that specializes in shoes, jackets and other accessories made from fish waste. In addition to providing employment for 300 local women and 17 factory staff, Owino is creating market opportunities for 80 local farmers who supply the leather factory with a range of sustainable products, such as papain, a papaya extract used as a leather softener, and bleaching agents and dyes made from moringa, hibiscus, and other locally-grown plants. “Our philosophy is to make as much use of locally available products as possible and to create market opportunities for low-income groups in the community,” Owino explains. He recently branched into the production of essential oils from water hyacinth, an invasive species that poses a major threat to fishing livelihoods around the lake. He is particularly proud that the project has established a sound partnership with traditional liquor producers, helping to provide a secure source of income for women otherwise involved in the illegal liquor trade. Owino’s strategy was to keep start-up costs low by using existing equipment and tapping the expertise of traditional liquor producers, while also enabling them to earn a more secure livelihood. Owino also spun-off another project supporting single mothers and other vulnerable women to venture into silkworm production and weaving. Owino’s ventures were featured on the side lines of the recently concluded fourth session of the UN Environment Assembly (UNEA-4), the world’s highest decision-making body on the environment. There, he enjoyed sharing his business ideas with a steady stream of visitors at the Sustainable Innovation Expo. Owino is one of many entrepreneurs and small- and medium-sized enterprises (SMEs) that have received support from the European Union (EU) funded SWITCH to Green Initiative. Implemented by the UN Environment Programme (UNEP, or UN Environment) as well as many partners from the private sector and civil society, the “Achieving Together” Initiative brings together inclusive green economy programmes in 34 countries in Europe, Asia, Africa, and the Mediterranean. 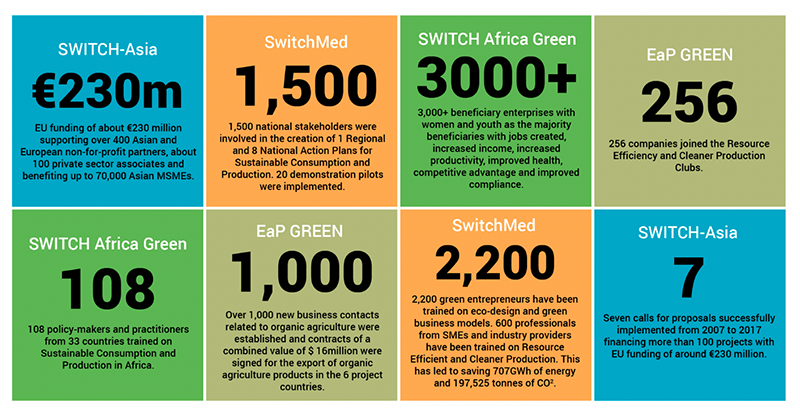 Collectively, the SWITCH-Asia, SWITCH Africa Green, SwitchMed and EaPGreen projects have contributed to 350,000 green jobs and leveraged more than US$1.1 billion in investments. As stakeholders from around the world convened at UNEA-4 to discuss the world’s environmental problems, the EU-funded SWITCH to Green Initiative came to illustrate what sustainable consumption and production (SCP) concretely means in terms of policies and business practices. The Initiative also illustrated how the world can move towards a circular green economy to achieve sustainable consumption and production, UNEA-4’s main theme. Evidence shows the SWITCH to Green Initiative’s approach is working. SWITCH Africa Green supported Owino, providing him with training in product design and business networking. During recent project-sponsored business networking trips, Owino signed a contract with Ghanaian customers and established links to government officials in Texas, US, who expressed interest in visiting his factory. Owino also attended UNEA-4, where he shared his business ideas with a steady stream of visitors at the Sustainable Innovation Expo. Jump to the Mediterranean, where just like Owino, 2,200 green entrepreneurs in the region received support and training on circular business models from the SwitchMed programme. This has led to the creation of 200 green companies and 1,000 new green jobs. One entrepreneur is Nour Kays, a Lebanese designer with a mission to change the way that “waste” materials are used and perceived. Kays compiles and reuses discarded plastic bags, transforming them into new materials that are used to create a collection of fashion purses and hand-made environmentally-friendly accessories. With SwitchMed support, Kays introduced five new items to her product line, which helped her increase the number of reused plastic bags to 3,800 per year. In the future, she hopes to reach 9,000 bags per year. Owino and Kays are just two of the entrepreneurs and SMEs benefiting from the EU-funded SWITCH to Green Initiative. As Satya Tripathi, UN Assistant Secretary-General and Head, UNEP Office in New York noted, “Until now, the focus has been on the ‘what’ and the ‘why’ rather than the ‘how.’ The SWITCH to Green Initiative is playing an important contribution by linking science and innovation with policy and practical implementation on the ground.” The graph below summarizes the Initiative’s global impacts. The SWITCH to Green Initiative’s are far reaching. Eight southern Mediterranean countries covered by the SwitchMed programme have adopted one regional and eight national SCP action plans. Twenty demonstration projects in the areas identified by these action plans have been implemented. Also in the region, the focus on resource efficiency and clean production has contributed to tangible benefits including: the savings of 3.5 million in m³ of water, 707 GWh of energy, 33,623 t of raw material and avoidance of 197,525 tons of CO2 emissions. In Eastern Europe, the use of economic instruments in the six countries participating in the Eastern Neighbourhood (EaP GREEN) project promote green financing and investment. These include environmental credit lines and subsidy schemes to encourage investments in energy efficiency and renewable energy, as well as innovative financing options for greening SMEs. In Africa, the SWITCH Africa Green booklet titled ‘Green Millions’ highlights a number of lessons learned, such as the need to establish close links between private sector initiatives and policy development. It discusses how international cooperation can promote the understanding, development and implementation of green economy and SCP policies, including through procurement systems. Another lesson learned is the need to simultaneously address the supply and demand-side, for instance, through public awareness raising for consumers. 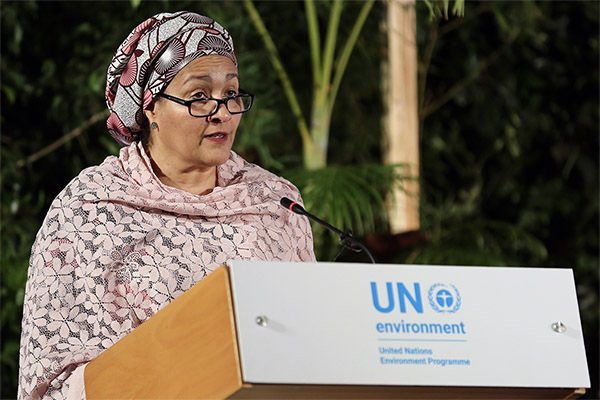 To celebrate successes and share lessons on how to move forward, the EU and UNEP organized a high-level round-table on 13 March 2019, at the Unon Press Centre, on the side lines of UNEA-4. Here, participants discussed the SWITCH to Green Initiative’s innovative suite of projects and how they enable the literal switch to a more inclusive, greener economy. Access to finance, however, was highlighted as a challenge, with round-table participants emphasizing the long way to go to fully tap the Initiative’s potential. One of the big issues highlighted was the funding gap: while there is a lot of financing available for innovative ideas, this is currently not reaching those with the most energy and drive – particularly young entrepreneurs and SMEs – that lack a proven track record. This further translates into problems with bringing successful project pilots to scale. Discussants underscored the importance of accurately measuring results to attract funding from impact investors that are usually more prepared to take on risk. Ultimately, the SWITCH to Green’s contribution was formally recognized in one of the UNEA-4 resolutions, titled, ‘Addressing environmental challenges through sustainable business practices.’ The resolution recognizes the role of global, regional, and national initiatives in promoting sustainable business, “including but not limited to green business practices, such as resource-efficient and cleaner production, SWITCH Africa Green, SwitchMed, SWITCH-Asia Programmes, among others.” The Initiative is showing what can be done and the world is taking notice. The Ambassador of Barbados and Antigua suggested an expansion of the SWITCH to Green Initiative with a dedicated programme for Small Island Developing States (SIDS). In the end, its about showing, not telling. And this is what the SWITCH to Green Initiative is achieving. The journey of green entrepreneur Khaoula Remmal, Founder of ENRD2, Morocco, which produces energy from agricultural waste. Yassine Ben Menadi, founder of Bio-Intrants Technologie, an organic agro-business in Tunisia. Lina Al Kurdi, founder of Green Roofs, a renewable energy and air-cleaning business in Jordan.